Professor Layton and his companions take to the skies aboard the airship Bostonius to solve the greatest puzzle known to mankind. Scour the globe for ancient artifacts and unlock the secrets of the Azran civilization. 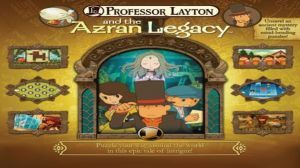 Hone your critical-thinking skills with 150+ in-game puzzles and minigames assisted by our exclusive guide for Professor Layton's latest adventure! Hey if you go to the challenges menu, then select challenge and tap the middle button In the bottom left corner, you can exchange play coins for challenges! Hope this helps.